IVF Laboratories rely on air filtration to protect the gametes from contamination during critical procedures. An independent inspection is used to certify that the air system is working, typically once per year. Acknowledging that this is inadequate, many laboratories are now installing expensive continuous monitoring systems at fixed positions. The HandiLaz® Mini gives the same level of protection at a fraction of the cost. This enables far more laboratories to consider employing this form of monitoring than ever before. The HandiLaz® Mini can be used to measure flow hoods, clean rooms, and HEPA filtered incubators. The HandiLaz® Mini provides an on the spot check that your air quality is up to scratch. Providing you with immediate verification that your air filtration system is producing Grade A air to EU GGMP standards. 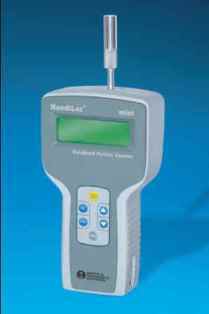 The HandiLaz® Mini particle counter is ergonomically designed to fit in the palm of your hand. It is rugged and dependable, and provides accurate recording at a great price. Having rechargeable batteries, the counter can be taken anywhere in the laboratory. Simply hold or place it in the test environment and start the test. The HandiLaz® Mini samples the air for a user defined time, counting the particles within three sizes ranges (0.3um, 0.5um and 5um). At the end of the test the results are displayed on the screen in units that can be immediately compared with the pass and fail criteria given in the standards (ISO or EU GGMP). Air is drawn through the detection chamber by a pump. A laser beam is directed across the chamber and any particles contained in the air reflect the light, appearing as a bright flash. The larger the particle, the brighter the flash. A photo detector measures the brightness of each flash and the meter counts and sorts them into the three size ranges. The software then calculates the results. The HandiLaz® Mini is calibrated by NIST traceable particles and adheres to the same standards that an independent inspector does. The HandiLaz® Mini interfaces directly by cable to an optional printer or PC.